We’ve finally made it to the first day of our holiest period of the year, the Paschal Triduum. We have passed through the 40 days long gauntlet of Lent, with some of us having lost weight from the all the fasting and others in withdrawal from all the abstaining from one vice to another. But we’ve made it. So, congratulations! Most of you would know today as Holy Thursday. But in the English speaking world, there is an older name, Maundy Thursday. The word “maundy” comes from a Latin word: mandatum, which means “mandate” or a “commandment”. And when we talk about “Maundy Thursday” we’re talking about the night that Christ washed the feet of His disciples, celebrated the first Eucharist with them, instituted the priesthood and last but not least, told His disciples exactly what He expected of them. And if you read a book or watch a movie about almost anyone else about to meet his end in a most horrible and violent way, you might think the lead character right about now would be saying something like “avenge my death”, or “make sure there’s payback”, or “don’t let them get away with this…strike back”. But this isn’t any other story. This is a story that turns everything on its head. The mandate, the mandatory thing Jesus tells us to do in this passage is this: “I give you a new commandment: love one another just as I have loved you. By this everyone will know that you are my disciples, if you have love for one another.” This seems to be an anti-climax. It probably wouldn’t do well at the box office. The story wouldn’t soar to the top of the New York Times bestsellers list today. But it’s a story that transcends all of those things. Because it’s the beginning of a story about what happens when the world does its worst through violence, and hatred, and fear, and yet love wins anyway. Today our Lord confesses and displays to His disciples and by extension to all of us, a profound love, an unconditional love, a love without BUT’s! The story of the washing of feet at the Last Supper in today’s gospel, is prefaced by St John’s poignant note regarding Jesus’ love, “He had always loved those who were his in the world, but now he showed how perfect his love was,” or in some translations, “he loved them to the end.” This simple statement is loaded with significance. “To love to the end” is to love freely, without reserve or limit, and without flaw or failure. It is love to the uttermost, to the fullest extent, to the extent of enduring the suffering and death on the Cross. Loving to the end reveals the depth of Christ’s love for us. We know the depth of someone’s love for us by what it costs him. In the case of Christ, it will cost him everything, His life. Though the disciples gave up on Him, He never gave up on them. Though they stopped thinking about Him, and were only thinking of themselves, He never stopped thinking of them. That is the first thing about this love. It is not offended by our failures. He does not withdraw His love because we make mistakes. We may often disappoint Him, we may often fail Him, we may often grieve His heart, but He goes on loving us. This is no claim of straw! I would like to draw your attention to what happened that first evening. 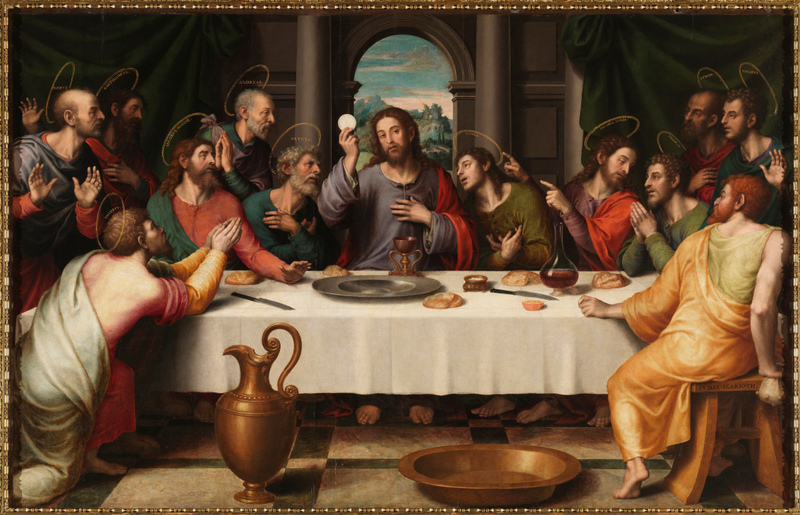 On that night, when Jesus washes the disciples’ feet and gives Himself to us completely in the holy food of the Eucharist, Judas is not excluded. Later, when you witness the re-enactment of that scene, I want you to just count. Without fail, you will count twelve men, right? Which meant Judas was among the Twelve. It was not eleven, but Twelve. Our Lord washed Judas’ feet to show him the extent of His love, a love that was not going to give up on the worst kind of sinner. Judas may betray our Lord and be condemned for it, but Jesus would not betray Judas. So let us transpose this gospel reading into our lives. We all fall into sin, great or small, on a daily basis. But every time we fall or find ourselves tempted to betray Christ in favour of something else, He does not turn us away. He is in the sacrament of the Eucharist, He is in the absolution of Confession, He is there for us; He does not give up on us. And this is, once again, truly unmeasured love, a perfect love, a love which loves to the end. But to love someone “to the end” doesn’t only mean to the end of one’s life. In the case of our Lord it points to a love that will never end. He will never stop loving His own. It isn’t a love that comes and goes, that is here today and gone tomorrow. “To the end” means a love that reaches to the fullest extent, that goes beyond any human norm of sacrifice or standard of giving. Loving “to the end” would mean the pouring out the cup of His life as a libation for the atonement of our sins. Loving us to the end would mean that not even death would be able to rob us of this great gift. On Easter, we will see love’s victory over death and sin. And that is why on the night when He was betrayed, on the night before He was led to Calvary, Christ reveals to us the furthest extent of His love for us. Tomorrow, He does this by ascending the throne of the cross, but today He gives us an example and a new commandment, a new mandate, to do likewise. “I give you a new commandment: love one another just as I have loved you.” This commandment is at the heart of our celebrations this evening. This commandment undergirds both the celebration of the Eucharist as well as the ritual of washing of feet. This commandment is finally actualised and perfected on the cross. The commandment isn’t new; but the extent of love, the standard of love is new. Our Lord did not replace or change the commandment, “Love your neighbour, as you love yourself.” Rather, He filled it out and gave it the best illustration ever – not just by washing the feet of His disciples, but more importantly by dying on the cross. The model of true love is Christ crucified. The appointed hour has come. We have escaped the whirlwind of our lives to gather, not in the cenacle but in this Church. We are weary. Lord knows that we are weary. Weary of the discipline of Lent, the tumult of life, the empty promises of love and the sting of betrayal of friends. So many are so weary that they cannot bear to look upon the face of Our Lord on the cross. It is just too painful. But if we care to look, our Lord wishes to show us how love looks like. It’s not worn as a badge or as a slogan emblazoned on our t-shirts. It’s not sweet platitudes or found in boxes of chocolates or large bouquets of roses. There is nothing warm or fuzzy, nice or sentimental about it. So, what does love look like? It looks like service. It means getting our hands dirty, humbling ourselves before the other, stooping to the lowest position, and finally embracing the cross. It looks like the cross. To love means to follow Christ, and this is what He did: “And being found in human form, he humbled himself by becoming obedient to the point of death, even death on a cross.” (Phil. 2:8) That’s how love should look like.